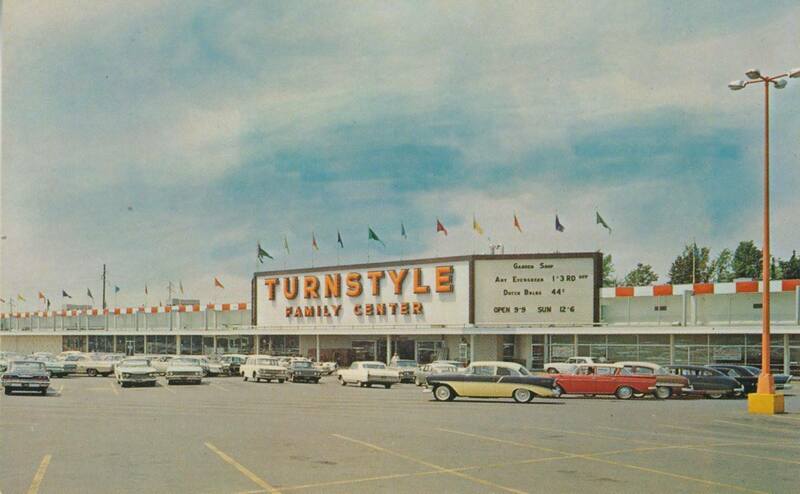 In high school I worked part time at a discount department store called Turn-Style. Located on Brady Street near what was then the edge of town, the meager income enabled me to purchase a used Volkswagen Beetle and save money for college. I made my first contribution to Social Security while there and learned work habits that continue to serve. Over the years, Jewel Food Stores sold Turn-Style to May Department Stores which converted it to a Venture Store. It was purchased by K-Mart. Today the building is a Theisens Home, Farm and Auto Supply store, owned by the same family that owns the store where I currently work two days a week. In high school I worked in the drug department which sold consumable products that included over the counter medicine and hygienic products, candy, tobacco, nuts, greeting cards, gift ware, sugary drinks, and recorded music. Most shifts I would spend part of my time stocking vinyl records, making sure any new arrivals made it to the sales floor, and the bins of albums were properly sorted and arranged. I picked records to play as background music before the days of Musak. There were no rules in the late 1960s and my supervisor seldom censored my choices. It gave me a chance to listen to music that wasn’t available on AM radio. I started buying vinyl and played it on my parents’ record player. As my collection of records grew an issue arose: the distinction between being a music player and a music listener. It caused me some teenage consternation. One of my neighborhood friends’ older brother was the drummer for a popular band called The Night People. They played at the Draught House next to the Mississippi River and the cool kids in my class went to hear them. I did not. I guess that made me a listener rather than a player, and I was okay with it. They would make fun of my friends and I when we talked about news from bands they had performed with. I got my musical start right after the Beatles came to America in 1964. I persisted in playing, despite derision in our neighborhood. My song list included mostly folk songs I played by myself. On occasion I played with a small group or with someone else who was learning to play the guitar. It seemed like there were a lot of us learning to play then. There was always a divide between what music I played and that to which I listened. In the end, a musician had to make a song their own. Bands like The Night People sounded just like The Beatles or Rolling Stones or whoever they mimicked. What art is there in that? Live bands like this were co-opted by disk jockeys who played original, prerecorded versions. If I was a music listener more than a player, it was to understand and adapt songs that might be a good fit for me. By all accounts The Night People were successful, and who ever heard of me? During those years in high school I made a decision in the Turn-Style parking lot. A friend wanted to go to Woodstock. We’d heard about it the week before and he offered to drive if I’d come along and pay part of the gasoline expense. We talked about it for a while and in the end I said, “I have to work Saturday.” That was a decision easily made. In it I chose to be less a music listener and more a player. It made all the difference. This entry was posted in Home Life and tagged #amwriting, Music. Bookmark the permalink.